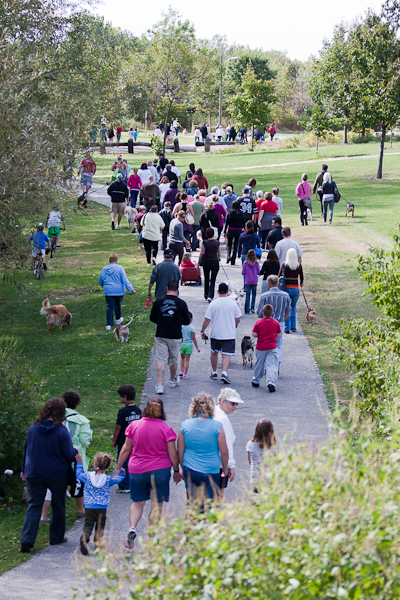 The 21st annual “Tails on The Trails” Pet Walk-a-thon takes place this Sunday at Malden Park and there is still time for you to participate! Visit the Humane Society’s website and download the pledge form, collect some pledges and take them along with your furry friends to Malden Park this Sunday at 11:00 am. Two distances will be available for your walking pleasure, a 1km route and a 2km route, and participants can choose whichever is easiest for them and their furry friends. Volunteers from the Humane Society, a representative from “Paw-sitively a Dog Thing” and staff from Pet Value will be along the route to treat you and your pets to goodies. If you have a dog, the staff from the Grooming Salon at PetSmart will offer a canine nail clipping service for $10 which will be donated back to the Humane Society. If you’re a little tired and sore after the walk, massage therapy students will be on site to help you get rid of your kinks for a donation (which will also be donated back to the Humane Society). Take a look at the fun from last year! !